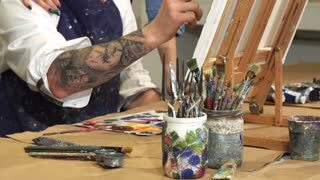 Sliding shot of a handsome tattooed bearded young male artist enjoying painting a picture at the Art Studio woth his beautiful happy girlfriend hugging him support happiness love dating romantic. Slow motion close up of a young playful guy cutting tomato for salad, making lunch with his girlfriend beside him. Relationship goals.